The Redwood Empire Sheep Dog Association has been a very big part of my life. In 1979, I got my start in border collies from my neighbor, the late Lester Bruhn, when he refused to sell me a pup. His reason was, “If you give a man a gun, he’ll shoot you with it.” I used this as motivation in my training after acquiring my first border collie pup. I have had the privilege of competing and learning from some of the late great Redwood Empire handlers such as Si Francis, Curt Beebe, Bruce Hagemann, Bruce Campbell, Leo Ielmorini and Lonnie Curtis. Another big influence in my trialing was Bob and Donna Meier. I met all but one of these people through the dog club and still consider them lifelong friends. I even met my wife Jeannie at the Napa County Fair Dog Trial in Calistoga in 1981. From 1980-1997, I had a very successful run at trialing with my first dog Ruby and then her daughter JoJo. In the mid 80’s, I dabbled in some drive trials. We enjoyed them but it was a totally different atmosphere without the comraderie of the rancher-based Redwood Empire. At about that same time I made the choice of dogs over rodeo. With a full-time dairy operation there wasn’t time for everything. I still believe I made the right choice. In 1997 my sons, Steven and Stanley, developed an interest in Little League and CYO Basketball, so I took a break from the dog club and started raising and training kids. When my boys were done with sports and became great ranch hands on the dairy, I acquired a ranch dog pup (Maddie). She had all of the qualities that I look for in a trial dog and I was ready to try my hand at trialing again so I rejoined the club in 2017. I am proud of the Clubs long history and proud to be a member of an organization that has fought off many changes over the years. I truly feel that we have a small unique dog club that is second to none. 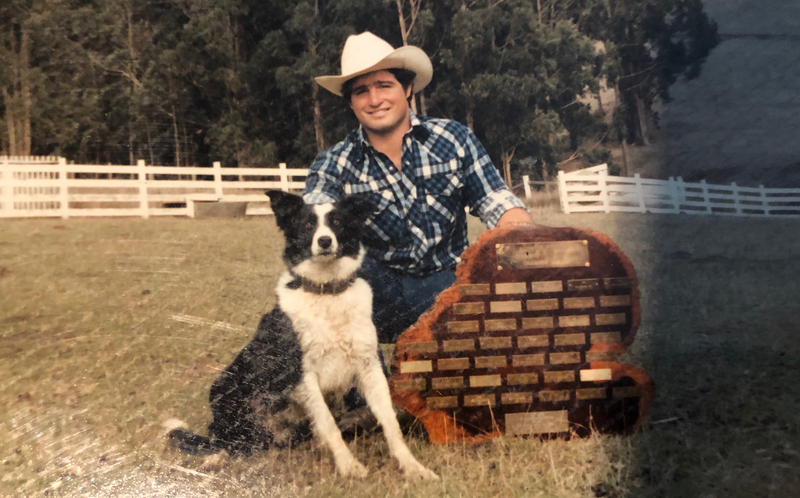 At their home ranch in western Sonoma County on May 18, Steve and Jeannie Moody will host a RESDA Sheep Dog Trial followed by a Mountain States Stock Dog Association style Cattle Dog Trial. A variety of settings and sheep flocks tests the mettle of both dog and handler. The dog and handler team scoring the highest number of cumulative points though the year is awarded the annual RESDA High Points Championship. In 1947, less than two years after World War II ended, a group of Mendocino County sheep ranchers decided friendly competition was the best way to determine who had the best working sheep dog. The ranchers designed a unique course that tested the variety of skills needed on a working sheep ranch and founded RESDA. RESDA Sheep Dog Trials using our unique course have been run each year since then. These trials demonstrate the teamwork required to successfully run a livestock operation. The RESDA Constitution and Bylaws detail rules governing our sheep dog trials and other operations. The current version of the Bylaws was updated at the 2018 Fall General Membership Meeting held on November 17, 2018. Complete documentation of Spring Meeting decisions, including judging assignments and no point trials.